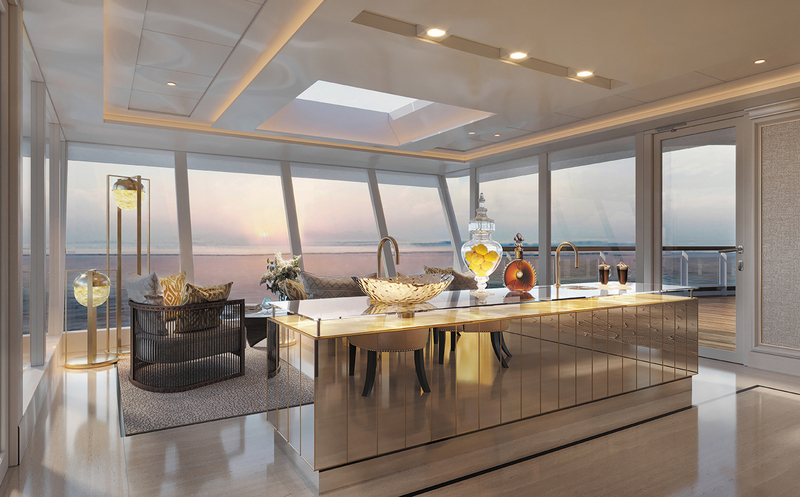 Regent Suite: Is this the most luxurious suite at sea? 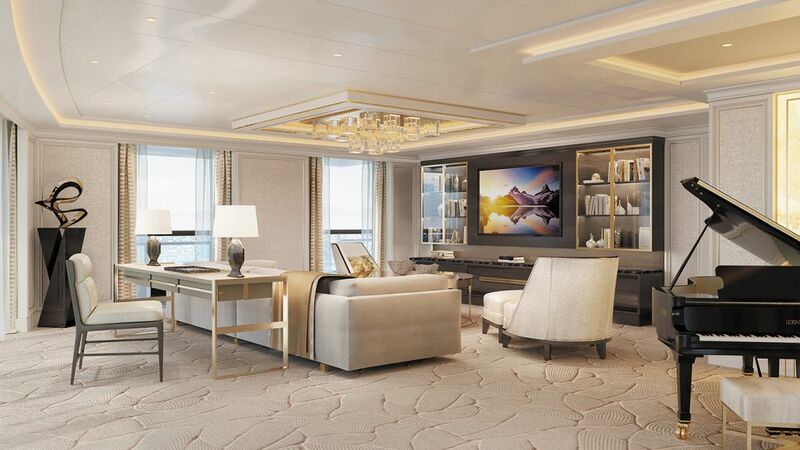 It was a bold claim when Regent Seven Seas Cruises promised to perfect luxury with its upcoming ship Seven Seas Splendor. And, if the first renderings of the Regent Suite are anything to go by, they just might have done it. Perched on the 14th deck of Seven Seas Splendor, the Regent Suite sits above the bridge and overlooks the ship’s bow. It is the largest suite ever constructed on a luxury cruise ship at 4,443 square-feet and comes complete with an in-suite spa retreat featuring a personal sauna, steam room and treatment area with unlimited spa treatments, unobstructed 270-degree views over the ship’s bow from the 1,300 square-foot wraparound veranda, and a glass-enclosed solarium sitting area on top of the bridge for a Captain’s view of the world’s most beautiful destinations. There is only one Regent Suite on board Seven Seas Splendor and it builds on the renowned reputation of the one on Seven Seas Explorer. The Regent Suite master bath and in-suite spa are 30 percent larger on Seven Seas Splendor to incorporate a stunning floor-to-ceiling ocean-view shower. A custom-made Treesse minipool spa has been placed on the front balcony, providing incredible views from the glow of dawn to the setting sun while guests soak and relax while sipping a glass of Veuve Clicquot. With over 300 hours of labour and an 18-month timeline to complete, the mattress will be the most luxurious bed at sea, allowing guests to sleep in unparalleled comfort and care each night after exploring the world during the day. A separate sitting area in the master bedroom features a sumptuous sofa and large flat-screen 4K ultra high-definition television. The interior décor features exotic woods, handcrafted furnishings, Italian marble and golden chandeliers. Curated art sculptures and priceless works of art adorn the suite. 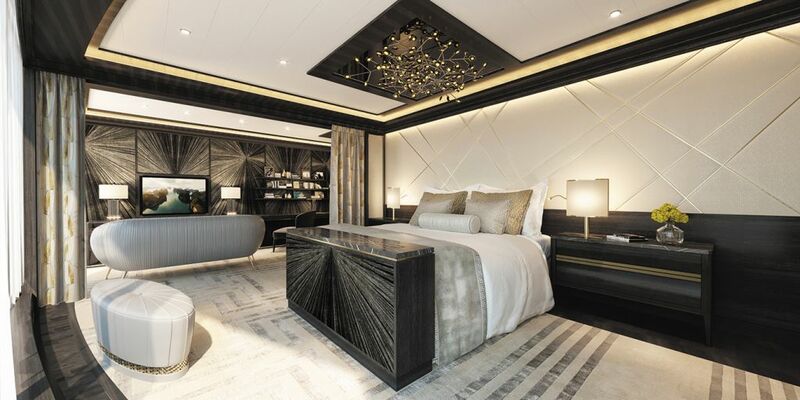 “The Regent Suite is the ultimate example of how Seven Seas Splendor will astonish luxury travellers with an unrivalled experience, and it reflects the superior level of detail you’ll uncover throughout this stunning ship,” said Jason Montague, president and chief executive officer of Regent Seven Seas Cruises.